The 84th Annual Southwest Open 2018 is a 9 Round Swiss tournament held in Irving (Texas) USA between 30 August and 3 September 2018. Watch the games of the 84th Annual Southwest Open 2018 with computer analysis LIVE on ChessBomb. The Serbian Women's 1st League 2018 is a 11 Round - 12-Team Round-Robin, held in Zajecar, Serbia between 31st August and 1st September 2018. Watch the games of the Serbian Women's 1st League 2018 with computer analysis LIVE on ChessBomb. The Serbian Men's 1st League 2018 is a 11 Round - 12-Team Round-Robin, held in Valjevo, Serbia between 31st August and 1st September 2018. Watch the games of the Serbian Men's 1st League 2018 with computer analysis LIVE on ChessBomb. SAINT LOUIS (August 30, 2018) – The world’s most elite chess grandmasters spent the last weeks of August at the Saint Louis Chess Club competing in the Saint Louis Rapid & Blitz and the Sinquefield Cup, the final two stops on the Grand Chess Tour. 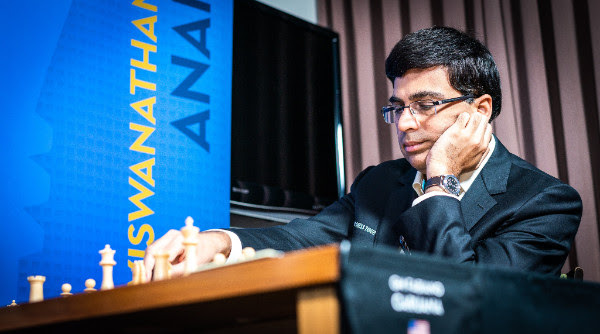 Among the premier international chess tournaments, Saint Louis Rapid & Blitz and Sinquefield Cup feature differing rates of play over a grueling 14 days of competition for a true test of chess genius. 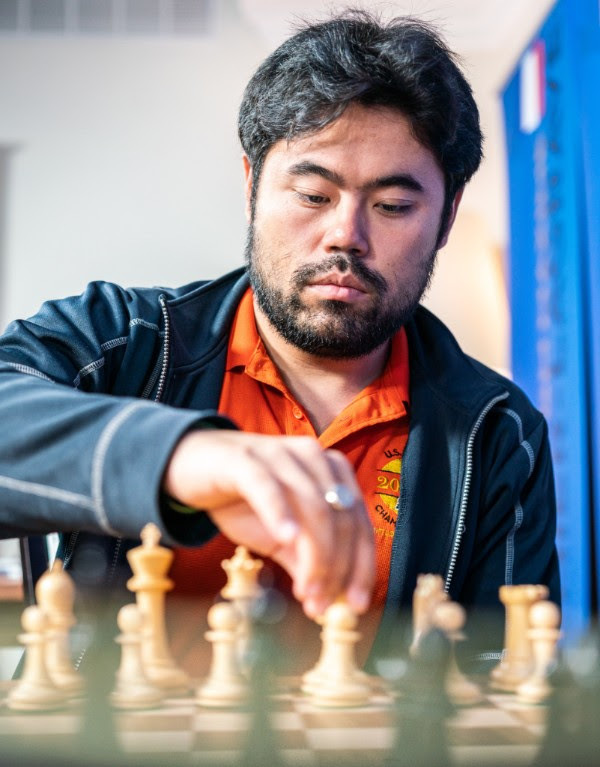 American Hikaru Nakamura was crowned the winner of the Saint Louis Rapid & Blitz, while the Sinquefield Cup concluded in a three-way tie for first between World Champion Magnus Carlsen, Armenian Grandmaster Levon Aronian and American Grandmaster Fabiano Caruana. The Saint Louis Rapid & Blitz tournament kept spectators on the edge of their seats as the first place position traded hands throughout. 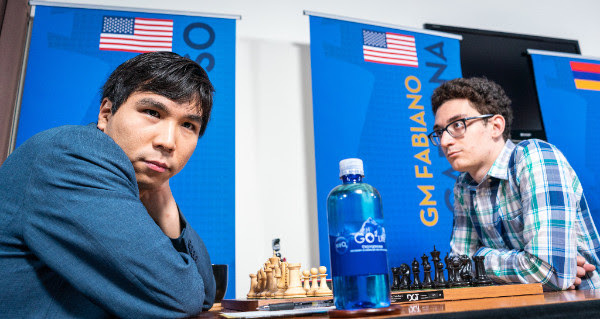 American Fabiano Caruana led during most of the rapid portion of the event, but blitz gave rise to fellow Olympiad teammate Hikaru Nakamura and Azerbaijani GM Shakhriyar Mamedyarov. 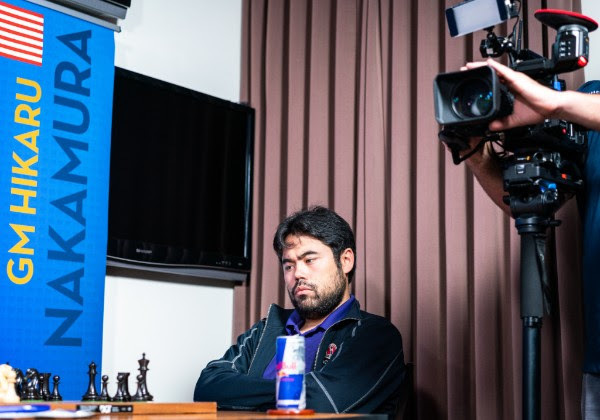 In the penultimate round, Nakamura was able to beat Mamedyarov to secure the title. 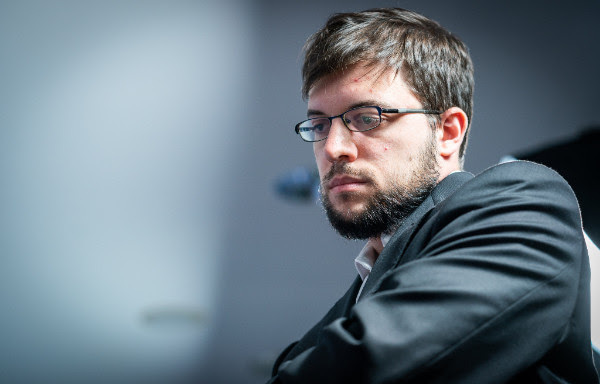 French GM and defending champion Maxime Vachier-Lagrave vied for a repeat victory but was never able to overcome a poor first-half performance. 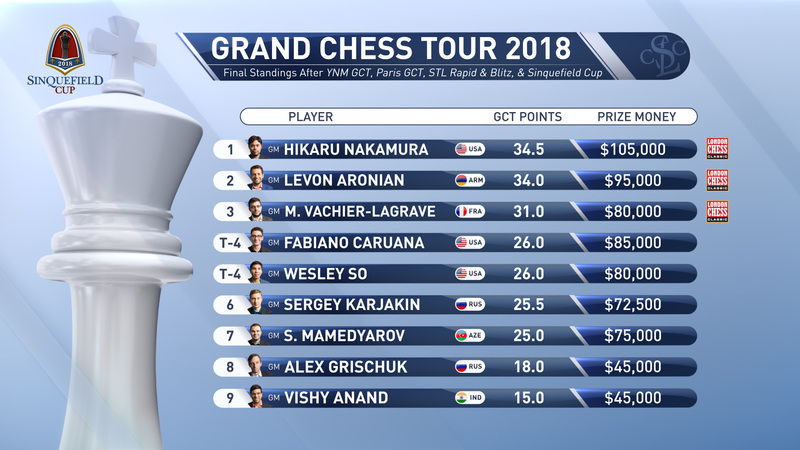 With the victory, Nakamura was awarded $37,500 and 13 Grand Chess Tour points, in the process qualifying for the Grand Chess Tour finalé to be held in London in December. The total prize fund was $150,000. 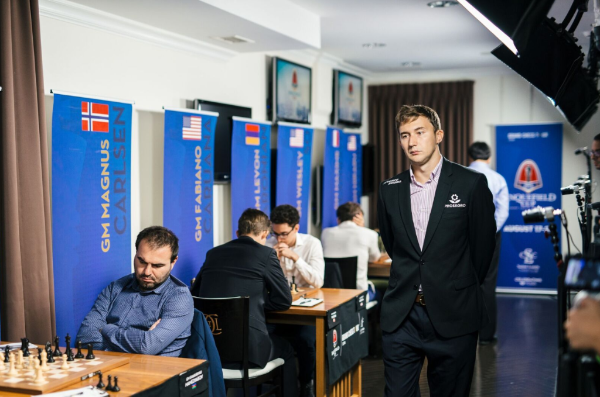 Immediately following the Saint Louis Rapid & Blitz, the nine Grand Chess Tour players started the only classical event of the tour, the Sinquefield Cup. The 2018 Sinquefield Cup saw the world’s top players fight to win in classical chess games with a $300,000 prize fund and final Grand Chess Tour standings on the line. World Champion Magnus Carlsen was invited as the wildcard of the event, guaranteeing a showdown with World No. 2 Fabiano Caruana in the only preview of the upcoming World Chess Championship this November. At the end of eight rounds, American Fabiano Caruana was in the lead by half a point. In the ninth and final round, Caruana drew his game while two of his closest rivals - Carlsen and Aronian - each won to draw even with Caruana. 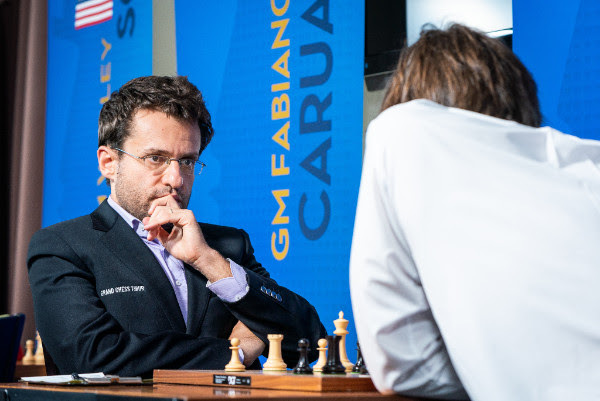 With a three-way tie for first between Aronian, Carlsen, and Caruana, tournament organizers turned to a tiebreak method to determine head-to-head matchups for two players in a playoff. After following tiebreak protocol, all three players remained tied, forcing a random drawing of lots between the three, eliminating one player by mere chance. 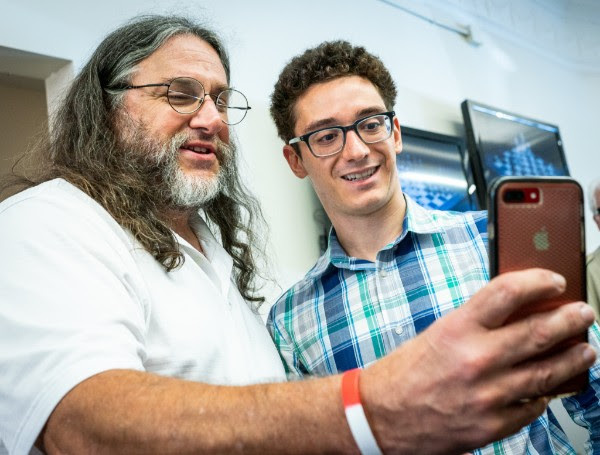 With this procedure in mind, Sinquefield Cup organizers decided to share the title, rather than see an opponent eliminated by chance over skill. The resulting decision concluded the 2018 Sinquefield Cup with co-champions Aronian, Carlsen and Caruana crowned in Saint Louis. At the conclusion of the Sinquefield Cup, the updated Grand Chess Tour standings guaranteed Hikaru Nakamura, Levon Aronian and Maxime Vachier-Lagrave qualification for the overall Grand Chess Tour title to be played in London, December 11-17, 2018. The remaining fourth spot was a tie between Americans Fabiano Caruana and Wesley So, forcing a tiebreak playoff. After two games of rapid chess, Fabiano Caruana emerged victorious and will join Nakamura, Aronian, and Vachier-Lagrave in London. The Grand Chess Tour title will feature three-day semifinals and finals—each in classical, rapid, and blitz style—and will be broadcast live at grandchesstour.org. The Saint Louis Chess Club is a non-profit, 501(c)(3) organization that is committed to making chess an important part of our community. In addition to providing a forum for the community to play tournaments and casual games, the club also offers chess improvement classes, beginner lessons, and special lectures. Recognizing the cognitive and behavioral benefits of chess, the Saint Louis Chess Club is committed to supporting those chess programs that already exist in area schools while encouraging the development of new in-school and after-school programs. For more information, visit saintlouischessclub.org. The Grand Chess Tour is a circuit of international events, each demonstrating the highest level of organization for the world's best players. The Tour was created in partnership between the Chess Club and Scholastic Center of Saint Louis (Sinquefield Cup) and Chess Promotions, Ltd. (London Chess Classic). The legendary Garry Kasparov, one of the world's greatest ambassadors for chess, inspired the Grand Chess Tour and helped solidify the partnership between the organizers. The Saint Louis Chess Club acknowledges Dr. Jeanne and Rex Sinquefield, whose generous support makes our tournaments possible. The STLCC and WCHOF admit students of any race, color, national and ethnic origin to all the rights, privileges, programs, and activities generally accorded or made available to students at the school. It does not discriminate on the basis of race, color, national and ethnic origin in administration of its educational & admissions policies, scholarship & loan programs, and athletic & other school-administered programs. The 15th Kalamaria International Open is a 9-round Swiss tournament taking place from 29 August to 5 September 2018 at the 4th-5th High School of Kalamaria in Thessaloniki, Greece and is organized by Kalamaria Chess Union, Thessaloniki Chess Union and the Muncipinality of Kalamaria. Watch the games of the Kalamaria Open 2018 with computer analysis LIVE on ChessBomb. The tradition of no repeat winners in the Sinquefield Cup ended in the most unexpected fashion. At the end of the day, there were three winners! 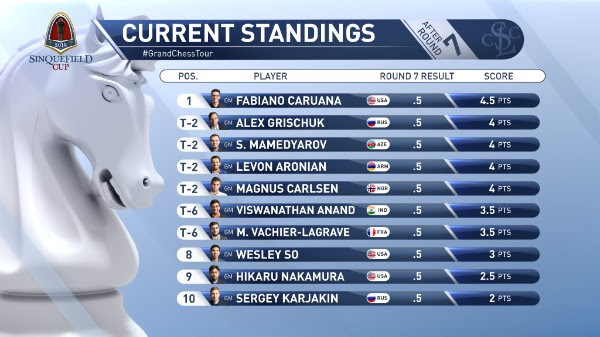 Fabiano Caruana, Magnus Carlsen and Levon Aronian tied for first place, while Caruana also tied for fourth place in the Grand Chess Tour standings with Wesley So. According to the rules, one of the players would have to be eliminated by a drawing of lots in a three-way tie, meaning that Caruana could potentially play two tiebreaks: One for the Sinquefield Cup and another for the Grand Chess Tour. The three players decided that they would rather share the title than have one of the players eliminated from participating in playoffs due to random chance. Hikaru Nakamura, Levon Aronian and Maxime Vachier-Lagrave qualified for the Grand Chess Tour Finals, while Fabiano Caruana and Wesley So will battle it out tomorrow for their ticket to the finale in London. Caruana once again chose the Petroff Defense, which keeps serving him quite well. 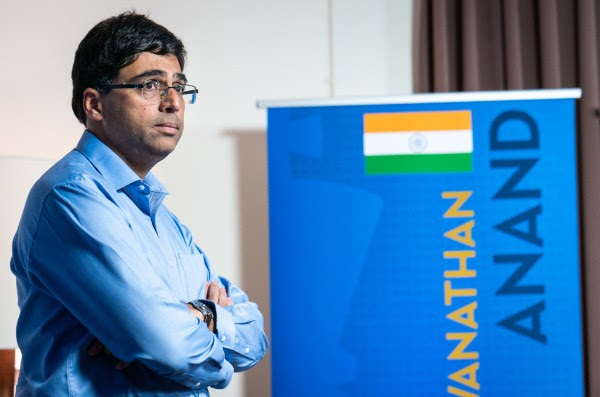 His countryman made the strange decision of not playing a more aggressive system, and odd choice considering he needed to a win to secure his spot in the Grand Chess Tour finals. Caruana had no trouble drawing the game and thus securing at least a tie for first place. Coming into the round, both players were half a point behind the leader. Levon Aronian thought his opponent was in a more vulnerable situation, because he needed a win to qualify to the finals, while Aronian only needed a draw. 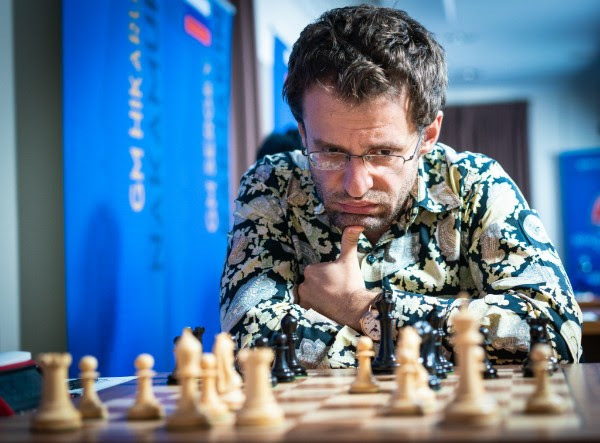 The psychological warfare played a significant role, as Aronian decided to play a risky sacrifice in order to take advantage of his opponent’s looming time trouble. After Grischuk moved, Aronian instantly sacrificed a rook, surprising the fans and commentators alike. Then he simply took a confident stroll away from the board. Grischuk was clearly caught off guard and was not able to play with precision while low on time. Aronian won the game in fantastic style, thus securing a tie with Caruana. There were no fireworks in this game, but it was a trademark Carlsen win. Historically, the World Champion has been a difficult opponent for Nakamura; their lifetime score is 12-1 in favor of Carlsen, not counting the draws. The game was quite balanced throughout until the American made the dubious decision of giving up a pawn in the endgame. Perhaps he thought that he had a fortress, but Carlsen has famously declared that he doesn’t believe in fortresses. 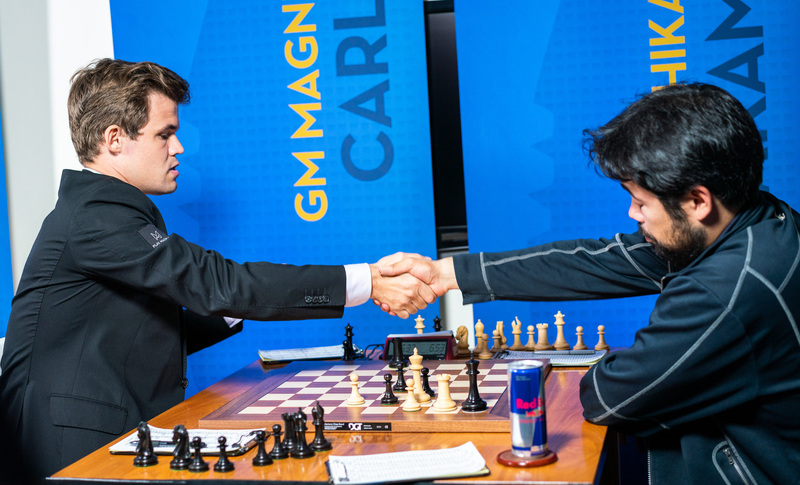 The 97 move struggle eventually ended in Carlsen’s favor, propelling Magnus into a tie for first, while coincidentally helping So tie for fourth place with Caruana in the Grand Chess Tour standings. The former World Champion ended the tournament with nine draws. Mamedyarov was another player who was chasing the leader by half a point, but never had a chance to play for a win with the black pieces. At the end of their long, theoretical battle, Anand had a slight edge with the white pieces but was not able to create real winning chances. The Russian Grandmaster’s nightmare tournament finally came to an end when he managed to eke out a draw in a torturous endgame. First he was down one pawn in a rook and bishop ending, and finally was down two in a rook endgame. Nevertheless, the minister of defense held on to the bitter end, forcing the Frenchman to surrender a half point after a long struggle. While Maxime might have been disappointed to not win this one, qualifying for the final in London will certainly ease his woes. As for Karjakin, the draw ensured that he was not alone in the cellar, as it was just enough to catch Hikaru on three points. Copyright © 2018 Grand Chess Tour. All rights reserved. It is the mission of the Saint Louis Chess Club, an educational organization, to maintain a formal program of instruction to teach the game of chess and to promote and support its educational program through community outreach and local and national partnerships to increase the awareness of the educational value of chess. Watch the games of the 2018 Sinquefield Cup with computer analysis LIVE on ChessBomb. The Novoborska Sachova Corrida features two matches, Boris Gelfand vs. Viktor Laznicka and Nitzan Steinberg vs. Tadeas Kriebel, consisting of four classical and four rapid games. The event takes place from 27 August to 1 September 2018 in Novy Bor, Czechia. Watch the games of the Novoborska Sachova Corrida 2018 with computer analysis LIVE on ChessBomb. After another peaceful day in Saint Louis, American Fabiano Caruana remains half a point ahead of the field. He is still being chased by a pack of players, including World Champion Magnus Carlsen. 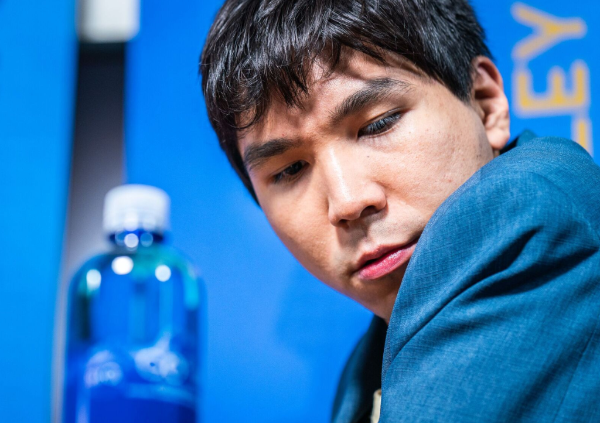 In the final round, he will be facing off against his Olympic teammate Wesley So, while his other teammate Hikaru Nakamura will have the black pieces against the World Champion. A win would clinch the title for Caruana, while a draw would open the door for a possibility of a playoff. With the tickets to the Grand Chess Tour finals in London still on the line, the final day is going to be a nailbiter! Caruana had a slight advantage out of the opening but it was not enough for him to keep the pressure on. There was one key moment in the game where the computers pointed out an improvement for him, but it wasn’t something that Caruana had considered and jokingly said that it was too sophisticated for him. He still remains half a point ahead of the field, and a tournament win would earn him a qualification spot to London. 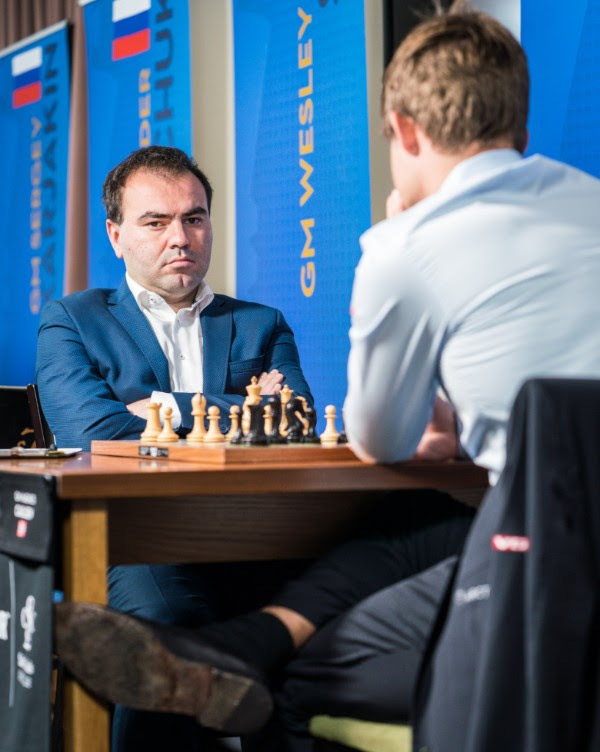 In their last encounter in Biel, Mamedyarov won with the white pieces but there was no repeat this time. The commentators believed that white’s position was better, but Carlsen reached equality by playing all the top moves suggested by the engines. In the endgame, the World Champion had an extra pawn, but his triple pawns on the e-file hindered any progress that could have been made. “For quite some time, it was my emergency idea” – Alexander Grischuk on his decision to play 1.f4. The last time this unusual move made an appearance in the Grand Chess Tour was in 2017 when Magnus Carlsen tried it out against Michael Adams with success. The position transposed into a Benoni structure, which was favored by the commentators and Levon Aronian who was spectating. The Russian Grandmaster blundered a pawn but for some reason So didn’t press for a win and ended the game with a repetition. The Armenian chose the Berlin Defense, an opening line that he defeated with the white pieces in round one. He actually had a slight edge with the black pieces but Vachier-Lagrave quickly sensed the danger and quickly exchanged the pieces to enter an opposite color bishop endgame. The game quickly ended in a draw thereafter. Neither player is having a great tournament so there wasn’t a lot of fight in this game. 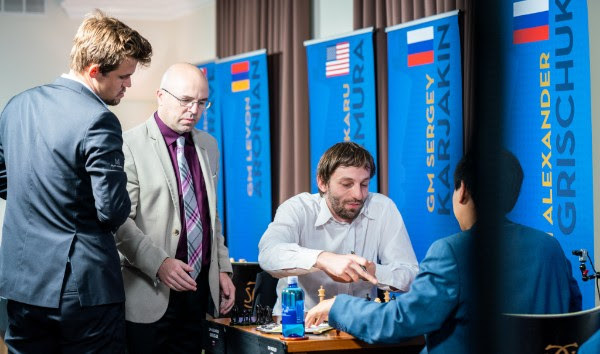 Sergey Karjakin essayed a line that was once played by his second Alexander Riazantsev. Nakamura played a novelty at the end of a long theoretical line. There was one key moment in the game where he could have transitioned to a position where he had a rook with a dangerous passed pawn on the seventh rank against two minor pieces. Instead, he decided to liquidate and enter an equal rook endgame that soon ended in a draw. The 6th edition of Francophone Chess Championship 2018 is a 9-round Swiss tournament taking place between August 26th and September 1st 2018 in Tirana, Albania. Players receive 90 minutes for 40 moves, followed by 30 minutes to the end of the game, plus a 30-second increment starting from move one. Watch the games of the Francophone 2018 with computer analysis LIVE on ChessBomb. A large crowd gathered at the Saint Louis Chess Club to watch the encounter between the World Champion and his challenger. The face off attracted so much attention that only media was allowed in the playing hall for the first 15 minutes of the game, while the fans patiently waited their turn. The game eventually ended in a draw, but the final result does not tell all the drama that happened during the four hours of gameplay. As this was their final official classical game, the chess world will have to wait until November to see Carlsen and Caruana battle it out once again, this time for the World Championship crown. There were no other changes in the standings as the rest of the games were also drawn. Going into the final stretch of the tournament, Fabiano Caruana is still leading by half a point. The World Champion started the game with 1.e4, and Caruana decided to stay loyal to the Petroff. Carlsen managed to get a slight advantage out of what seemed like a dry position. His advantage kept growing even though Caruana played the best moves according to the engines. Carlsen was closing in on his opponent when he found himself low on time. The looming time trouble and Caruana’s resourcefulness allowed the world championship contender to miraculously save the game. At one point, Carlsen went into the confession booth and made a shushing gesture, leaving everyone speculating the meaning behind it. He later explained that he thought he was already winning and wanted to have a little fun. 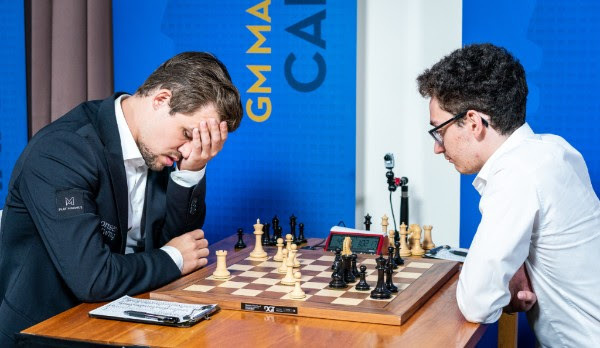 Upon seeing the video, Caruana also assumed that his opponent was under the impression that the game was over, finishing his thought with “but it wasn’t!” Carlsen was seemingly disappointed with his play, notably with his failure to be practical and make decisions. He remains half a point behind Caruana. This fascinating Najdorf would have been the game of the day were it not for the Carlsen-Caruana game. The 19-move theoretical line resulted in a complicated position, with equal chances for both players. Coming off of his third loss in this tournament, Karjakin really needed to stabilize while Mamedyarov, who is trailing the winner by half a point, needs to close the gap with a win. The game was near perfect, as both players found the best moves in the position. Eventually, the game petered out to a draw in a bishop endgame with not enough pawns on the board. Aronian was clearly playing for a win and came up with interesting and unusual ideas in the middlegame. He chose a rare line in the Catalan and the players found themselves in an unknown territory after So’s novelty on move 13. White had an advantage but did not play ambitiously enough. So made the correct decision of exchanging queens to transition into a passive endgame which was enough to hold the draw. Vachier-Lagrave was surprised by his opponent’s decision to play a line that led him to a worse position. The Guicco Panno variation left white with the pair of bishops and a long term advantage with no risk. Nakamura suffered for most of the game, but true to his style resolved his problems in a tactical manner. The Frenchman’s play was too straight forward, which allowed Nakamura to neutralize his advantage. Not finding a better continuation, Vachier-Lagrave exchanged the pair of rooks and one of his bishops for a knight. The resulting opposite color bishop endgame ended in an easy draw. This was one of the most balanced games of the day, with neither player making any big errors. The players essayed one of the most popular openings at the top level these days, the Giuoco Piano. In a closed position, the players maneuvered until move 20, when the pawn exchanges in the center opened the position. The change of the pawn structure resulted in piece exchanges, reeling the game towards a draw.